Fig. 1 ALMA images reveal many giant planets forming in orbits of protoplanetary systems. The solar system comprises two fundamentally different types of planets: giant and terrestrial. At present, the origin of these two classes of planets are not understood. 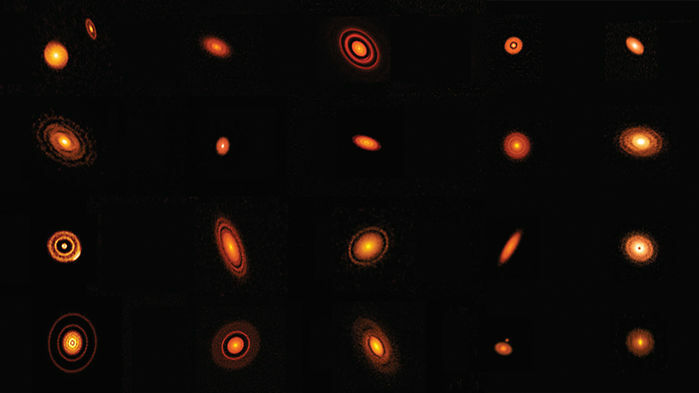 The recent Atacama Large Millimeter/sub-millimeter Array (ALMA) images of more than twenty young star systems provide information suggesting the origin and composition of giant planets. At the temperatures of these systems (<50 K) planets form from the same particles of ice that are being imaged. Solid Methane gas hydrate (MGH) forms naturally at the extremely low temperatures in the outer reaches of Large Dark Nebulae. In MGH, a clathrate, twelve or more water molecules form rigid cage-like, structures. Most of these physically encapsulate a methane molecule, but larger cages can envelope a wide range of ‘foreign’ molecules or atoms, maximizing the mass of particles incorporated. The nominal composition of pure MGH is (CH4)8(H2O)46, with an average density of 0.9 g/cm3. Tests have shown that MGH is two orders of magnitude stronger than water ice at 208 K and the difference increases with decreasing temperature. The strength is further enhanced in highly deuterated MGH. Millimeter studies of Large Dark Nebulae (LDN 1689N, 134, 154, 1544)1 report a 1010 enhancement of deuterium fractionation in the form of ND3 and D3 molecules in their colder outer reaches (20 K). Surfaces of dust particles in dark nebulae act as catalysts for the formation of simple molecules, H2 (D2) which then combine forming ices, primarily H2O, HDO, D2O, encapsulating the heavy elements in the form of dust or nanoparticles. Accretion continues at the next stage by the formation of deuterated MGH. By this symbiotic process, clathrate giant planets accrete the complete heavy element abundances in nascent stellar systems increasing their average densities to ~ 1.33 g/cm3. Young star systems revealed in the ALMA images are natural progressions of LDNs as they contract, and their intrinsic angular momentum becomes manifest. As observed in the LDNs, high concentrations of deuterium are present in the cold outer reaches of protoplanetary systems where giant planets form prior to the initiation of nuclear fusion in the proto-star. Increasing gravitational pressure during accretion compensates for later increases in temperature (Fig. 1). Cold hydration makes possible the incorporation of the noble gases, argon, krypton, and xenon which have been detected in Jupiter by the Galileo atmospheric probe. As observed in the ALMA images, the giant planets alone comprise the nascent star system. The MGH composition of giants suggests that they are ~ 85% water. Therefore, the giant planets in the solar system comprise 275 earth-masses of water. All the icy satellites and rings orbiting the giant planets are due to impacts which ejected material, primarily water into the surrounding space and releasing methane in their atmospheres. Fig. 2. 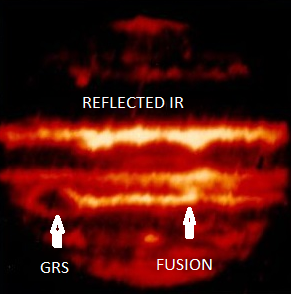 Fusion reaction energy flowing to GRS. Reflected energy from NEB. Fig. 3. 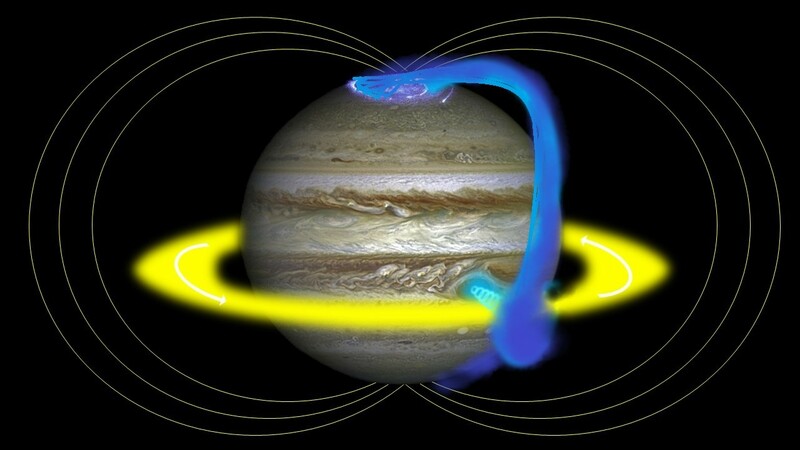 Helion stream (yellow) which produces Jupiter’s magnetic field. Vortical streams (blue) deflected to the poles, form auroral ovals. Two powerful vortical streams are deflected by the existing magnetic field to the poles, producing the constant auroral ovals. The north-south asymmetries of the magnetic field and atmospherics are due to the location of the energy source at the Great Red Spot, at 22º S Lat. 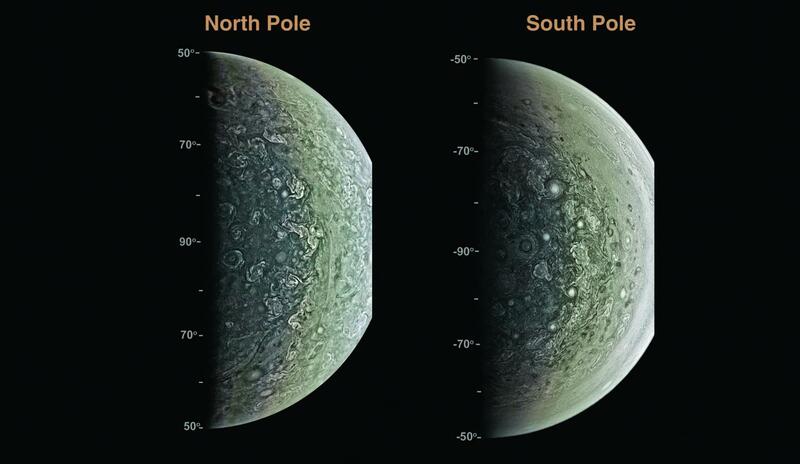 No magnetic field is generated in the solid MGH interior of Jupiter, but iron and nickel dispersed in dust particles act as a weak permanent magnet, its field induced by the exterior magnetic field. The heavy elements, released from the MGH by the fusion heating, react to form high temperature compounds, cooling as they rise more slowly through the GRS vortex forming solid particulate aerosols, such as CS which forms tiny red crystals, producing the color of Jupiter’s red spot and clouds. These particles fall to the surface of Jupiter beneath the cloud-tops as rapidly as they are released. As a result, the clouds cover only ~ 60 degrees of latitude centered on the GRS. Some of these particles are carried within the polar vortices and cause spurious emissions within the constant auroral ovals. The heavy element aerosols have been collecting on the surface beneath the clouds since the fusion reaction was reduced to solely proton deuterium (1935). Its distribution is affected by the surface wind. This is currently being interpreted as a deep atmospheric signal, but as Juno coverage increases is being understood to be static. Fig. 4. The blue oceans at both poles of Jupiter.thern exposure of Jupiter’s surface extends to lower latitudes tha the Southern. Poleward of the cloud-covered ~ 60º centered on the GRS, the blue oceans of melted surface MGH are visible. The polar regions are warmed by the polar vortices of high energy helions which form the auroral ovals. The depth of this water layer will determine whether future astronauts will require boots or boats. The ALMA images have stimulated papers suggesting that the images will provide information on the accretion of the terrestrial planets. However, the primary message of the ALMA data suggested herein is that the giant planets are solid, highly deuterated, methane gas hydrate bodies with a full complement of the known solar system element abundances, in the form of its average density 1.33 as compared to pure MGH with a density of 0.9 g/cm3. Most significant, the most abundant elements, hydrogen and oxygen, are in the form of H2O. The proposed ongoing fusion reaction implies that a highly energetic (geologically) recent impact has demonstrated the suitability, even the probability, that an impact created a new terrestrial planet. The only terrestrial planet which is hotter and less well understood than Jupiter is Venus, or is it proto-Venus? The impacts of the larger fragments of Shoemaker-Levy 9 ‘comet’ produced ‘main events’ delayed by 10 minutes, which were never adequately interpreted. These delays were the time that the mushroom clouds from the fusion explosions on the surface took to rise to the cloud-tops, becoming visible. The complete abundance of elements, high deuterium and water content of the giant ice planets are ideal sources for producing terrestrial planets. Impacts on these giants instantaneously compress and heat the deuterated surface producing powerful fusion explosions exponentially increasing the energy of the impacts. Heavy elements blasted into the inner solar system by these impacts quickly collapse releasing gravitational and recombination radiation forming a hot, near-spherical molten core/mantle of a terrestrial proto-planet, which has no inherent spin. This radiation pressure disburses the lighter elements throughout the inner solar system, producing equinoctial lights, which eventually become captured by the extant planets and the new planet when it cools.3 The rampaging, molten proto-planet interacts with extant terrestrial planets to circularize is orbit, potentially changing others. ALMA images reveal twenty icy young stellar systems, <50 K, each with several giant planets. LDN studies suggest the giant planets comprise highly deuterated MGH known to form naturally at these temperatures. This suggests a re-interpretation of Galileo and Juno mission data will provide a basic understanding of the giant planets. 1 .E.Roueff. Interstellar deuterated ammonia: from NH3 to ND3, (2005), DOI: 10.1051/0004-6361:20052724. 2 P. Kollmann et al. A heavy ion and proton radiation belt inside of Jupiter’s rings, Geophysical Research Letters, 16June, 2017, p.5259 5268. 3 L. A. Frank J. B. Sigwarth, Atmospheric holes: Instrumental and geophysical effects, JGR, 1Jan 1999. ~ by Angiras on January 17, 2019.